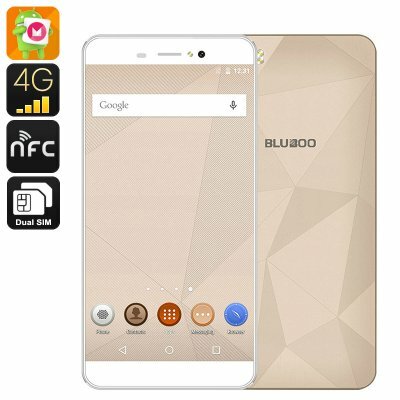 Successfully Added Preorder Bluboo Picasso Smartphone - 5 Inch 2.5D Arc Screen, Android 6.0, Dual SIM, 4G, Quad Core CPU, 2GB RAM (Gold) to your Shopping Cart. This Product is a Pre-Order Product that is expected to be shipped on the 17 of November. Do not order with other products. This is a Pre-Order product and as such the weight, dimensions and specifications of this product could be subject to change. We will update the listing when the product is received in stock. A budget phone with a lot to offer, the Bluboo Picasso Smartphone is a masterpiece that is a top flight budget phone with plenty if perks. For starters, this neat little smartphone comes with a 5 inch screen featuring 2.5D arc glass and an HD resolution. The curved edges and weighing only 150 grams it's easy to grasp and hold in one hand. An HD screen proves that 720x1280 resolutions are plenty for viewing movies, surfing the web or playing games and with IPs technology you get nice viewing angles and natural rich colors for a great viewing experience. At the heart of the Bluboo Picasso is a Quad Core CPU and 2GB of RAM, so there's enough performance for you to enjoy decent gaming. 16GB of storage should suffice but with a micro SD card slot you can add up to 256GB extra space for all your media. With an Android 6.0 operating system, you will be able to quickly and effortlessly navigate between all the apps and have loads of functionality at your fingertips. The Bluboo Picasso smartphone has2G, 3G and 4G network support and with Dual SIM dual you can take control of multiple numbers switching between the two for better regional coverage or to avoid roaming charges so your get the best of both worlds. A 2800mAh battery brings a generous amount of talk time while front and rear cameras ensure you will be able to snap attractive shots and selifes. This 5 inch Bluboo Picasso smartphone comes with 12 months warranty, brought to you by the leader in electronic devices as well as wholesale Android Phones..